Who are Dance Marathon Volunteers? who are interested in helping the Marathon run, but with a smaller time commitment than a Captain position. 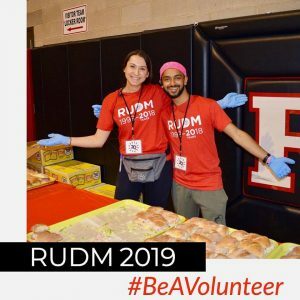 Students who register as Volunteers raise $150 to participate, and Volunteers are selected based on when they raise their minimums, either by the deadline, or until all 200 spots are filled. Volunteers will be assigned one shift during DM weekend and will mainly assist the Event Logistics team. When do Volunteers help out? Dance Marathon Volunteers only assist during Marathon Weekend during either session. How can I register to Volunteer? Any additional questions can be sent to info@marathon.rutgers.edu.